Heartbreaking stories involving cruelty to animals continue to make seemingly never ending rounds, but sometimes the victims become heroes and their stories remind us of what can be accomplished when people refuse to accept the way things are. This is one of those stories. 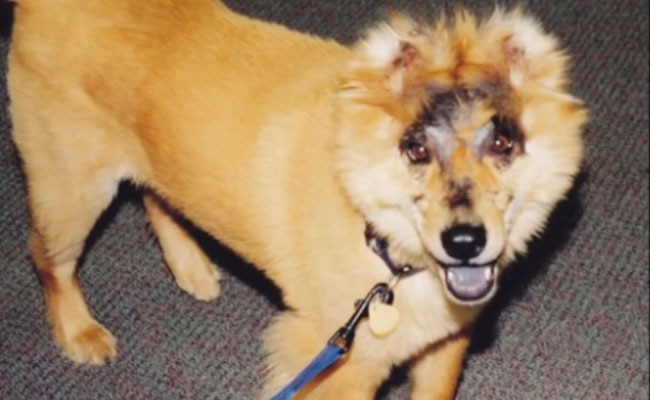 It began back in 1994, when a 10-week-old puppy named Gucci was hung from a tree, beaten, doused in lighter fluid and set on fire by a group of men in Mobile, Alabama. College professor Doug James was nearby by pure chance and rushed to help. He would later become Gucci’s second owner and together the two would eventually bring about a historic change in Alabama’s animal cruelty laws through legislation honoring Gucci. Now, his story is being told through A Dog Named Gucci, an inspiring feature-length documentary directed by filmmaker Gorman Bechard, who decided to delve into a new genre. Featuring perspectives from many involved in Gucci’s case, including lawmakers, lawyers, the media, law enforcement officials, rescuers and the veterinarians who worked to save him, the film also highlights how much progress has been made over the years since this happened because stories like this inspired people to fight for change. When what happened to Gucci first made headlines, only 12 states had felony animal cruelty laws on the books. Now they all do, as of 2014, and offenses are finally being taken more seriously. Gucci passed away in 2010, but despite being the victim of unspeakable cruelty, he ultimately triumphed by living a life filled with love and leaving behind a legacy like other dogs the film touches on, including Susie, another burn victim who inspired change in North Carolina, Nitro, who died from neglect in an Ohio kennel, and Louis Vuitton, who would become the first to test Gucci’s Law in Alabama. Bechard said he hopes viewers realize that they can be the voice for animals. “There are so many ways to do that, to help, to get involved. From something as absolutely simple as sharing that Facebook page of the lost or abused pet, to walking dogs at a shelter, to making that call when you see an animal in danger (locked in a hot car, chained in a back yard without water, or shade, or in the freezing cold), to going to the courthouse when an animal abuser is on trial, the list is endless. Doug James changed a law, but he showed us we can all be the voice for animals,” he said. The film will be released on DVD and digital platforms on April 19, and is available for pre-order on Amazon. The film’s anthem song One Voice, which features a myriad of talented artists, including Norah Jones, Aimee Mann, Susanna Hoffs, Lydia Loveless, Neko Case, Kathryn Calder and Queen’s Brian May, is also available for pre-order on iTunes. For more info, visit A Dog Named Gucci. I hope the men who did this to Gucci were severely punished! Anyone who can treat a puppy or any animal that way, would also be abusive to a child or his spouse. He should be locked up forever. Special place in Hell for abusers. May God remember this beautiful dog named Gucci! Just placed my order for the DVD. R.I.P. sweet Gucci!! Thank you, Mr. James, for rescuing that beautiful dog! !